The MAX® S-Series is Red Sea’s flagship reef system and features the very latest in reef-keeping technology. WiFi controlled Hydra 26™ HD LED lighting, REEF-SPEC® filtration and circulation systems, customizable fascia and a one-plug control center allow you to focus on the beauty and diversity of your own piece of coral reef, rather than worrying about component selection, suitability and compatibility. MAX® S systems are available in Pearl White and Black. 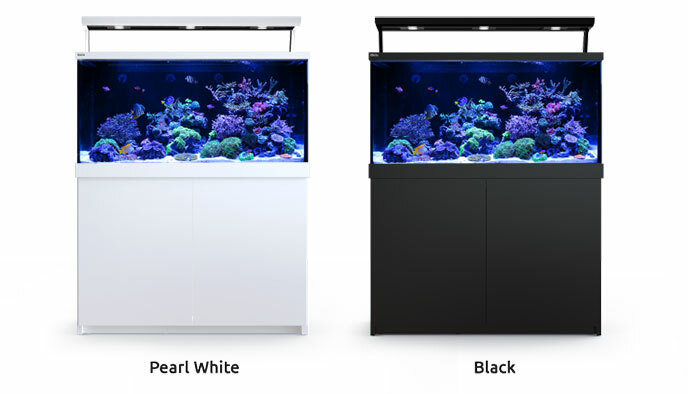 The cabinet side panels and doors are attached to a marine spec aluminum frame and can be replaced at any time, allowing renovation or a complete colour change on a functioning aquarium. This feature combined with the replaceable trim on the light and aquarium adds an unprecedented level of longevity and flexibility. All external surfaces use weather resistant polyurethene paints (similar to those used in the car industry) giving an elegant and durable finish. The Max S-Series is an innovative plug & play, complete, full size coral reef aquarium system. It is designed to allow you to focus on the beauty and diversity of your own piece of coral reef, rather than worrying about component selection, suitability and compatibility. 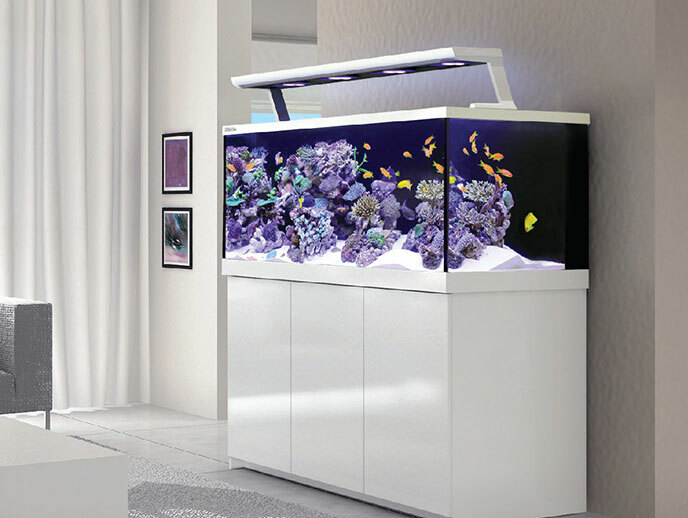 Max S-Series aquariums are fully equipped with everything you need including features such as ultra clear glass, reef spec lighting and filtration, customizable fascia and a one-plug control panel. 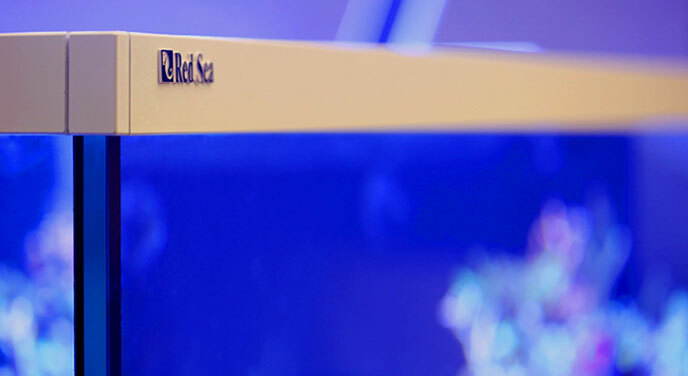 Choosing the Red Sea MAX S-Series will make reefkeeping easier than ever before. The MAX® S-Series incorporate all-new Hydra 26™ HD LED lighting, providing the most up to date LED technology to give superb performance and a remarkably user-friendly interface. The Hydra 26™ HD unit offers a full spectrum, 7 colour LED configuration giving great colour rendition and a multitude of lighting effects. The revolutionary control system dynamically adjusts the power available to each colour by utilizing power not being used by other colours, effectively enabling selected channels to be ‘boosted’ to above 100% output. The lighting is fully controllable via a built-in WiFi which is compatible with iOS and Android devices and with any WiFi-enabled Mac or PC. At only 90w power consumption per Hydra 26™HD, the MAX®-S achieves excellent performance at a fraction of the running costs of using traditional T5 Fluorescent lighting. 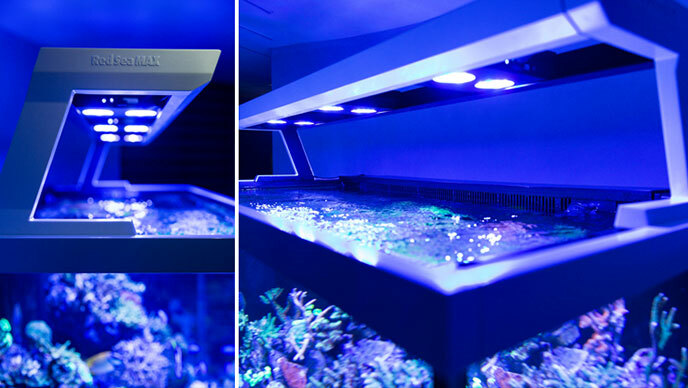 The lighting fixture features Red Sea’s unique,mounted lighting chassis that slides across the width of the tank, providing easy access for all aquarium maintenance tasks. MAX® S-Series aquariums are constructed from 12 – 15mm ultra clear (low iron) glass supported by saltwater resistant plastics and a marine spec annodized aluminum frame. Designed for simple home assembly, all of the glueing, sawing and wiring has already been done for you. The complete reef filtration system starts with the surface skimmer that feeds the water to the in-cabinet sump via a flow-regulated, silent flow downpipe. The filtered water is returned to the aquarium by a main system pump that also supplies water to all of the filtration systems such as the protein skimmer, an optional chiller and/or reactors. Connection between the aquarium and sump is via standard union connectors so no plumbing is required. The MAX S-System is supplied with the main system pump, C-Skim 1800 protein skimmer, mechanical and carbon filtration media and all piping including preparation to connect a chiller and auxiliary reactors. 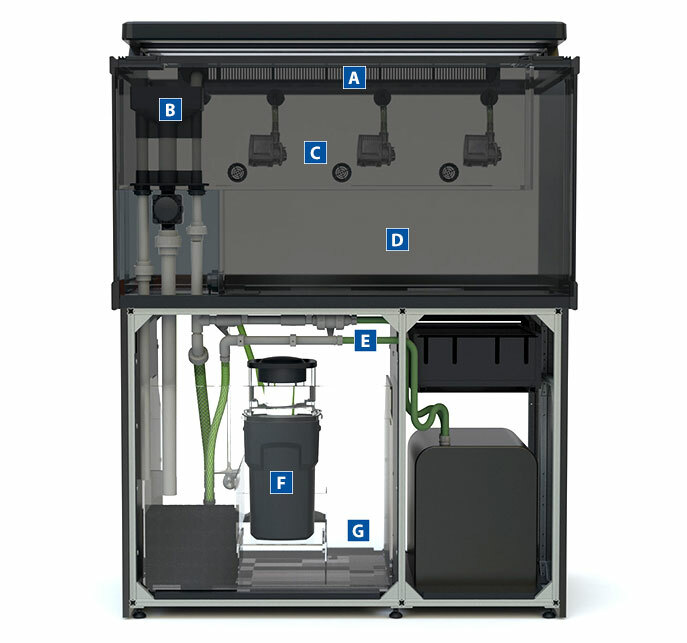 The MAX S-Series filtration system follows the one-plug MAX concept and features a power control centre with easy access to 10 individually switched power sockets for all pumps, and other accessories, safety protected with integrated circuit brakers.